Environmental history is a particular way of interpreting the past. In one respect it directs us to consider the effect of human activity on farmland, but then also nature’s effect on human culture. In short, human-land relations are dialectical in nature. It’s not that simple though, for humans have had a range of effects on the land. Oftentimes this activity has left the environment in degraded state, the result of a kind of “environmental sin.” At other times humans have engaged in multiple ways to create sustainable environments. Some have done so by debating the very idea of “sustainability,” others by employing ancient farming methods, and others by harnessing the most innovative and technologically advanced agricultural systems. Mennonites have had a particular experience on the land. As a people disproportionately rural and committed to relative simplicity, they had been more active in agriculture than many other faith-based communities. For this reason Mennonites have often gathered to consider ways their rootedness in the soil. They have pondered the intersection of ‘Anabaptist’ teachings on community cohesiveness, on nonviolence and on service with a healthy interaction with the land. At this conference we consider the history of this relationship, mostly in the 20th century. It has been a period of remarkable change: old organic-based, community-oriented approaches have given way to a new reliance on fossil fuels, herbicides, global markets, governmental programs, and economies of scale. But we also take a much-needed global perspective, seeking to understand how climate, specific commodities, levels of wealth, types of government, cultural and ethnic contexts, histories with colonialism, settler-indigenous relations, have affected agriculture. By focusing on seven broadly conceived communities, we try to make the global approach manageable. 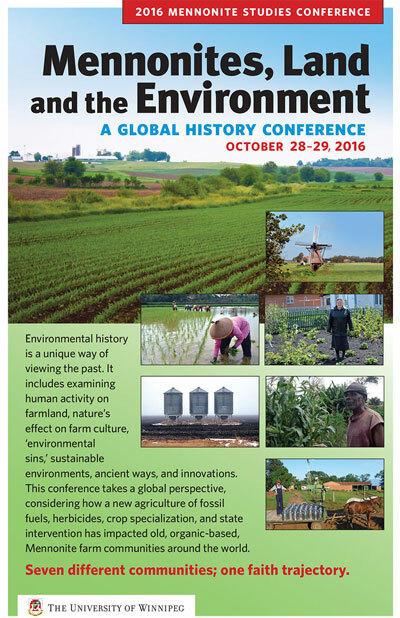 But we also seek a comparative history, and through this approach hone the questions we may have of environmental history. So, welcome to this conference. May the rich array of papers stimulate your thinking, adding knowledge and understanding to a crucial concern of all us. What has the Mennonites’ relationship with the environment been? How and why has it changed over time? What is the basis of hope for the future? 7:00 p.m. Paper Presenters and Chairs meet in the Faculty Club, 4th Floor Wesley Hall, University of Winnipeg, for a pre-conference reception. FRIDAY, OCTOBER 28, 8:30 a.m.
Aileen Friesen, University of Winnipeg, “Sowing Hatred or Prosperity: Agriculture and Believers in Post-World War II Siberia"
Susie Fisher, University of Manitoba, “(Trans)planting the West Reserve: Mennonites, Myth, and Narratives of Place’"
Carolina Vargas, El Colegio de la Frontera Sur, “Vulnerability and Agriculture among Mennonites in Quintana Roo." Major Contributors: Special thanks to: the DVCM Committee of the Mennonite Historical Society of Canada with a grant from MCC Canada; The University of Winnipeg; D.F. Plett Historical Research Foundation Inc. The Planning Committee: John Eicher (Washington), Hans Peter Fast (Utrecht), Susie Fisher (Gretna), Aileen Friesen (Kitchener), Danang Kristiawan (Jepara), Royden Loewen (Winnipeg), Belinda Ncube (Bulawayo), Ben Nobbs Thiessen (Phoenix). Parking: Park at any one of a dozen Impark parking lots around the University, at the ANX Parkade off of Colony, or the Hudson’s Bay Parkade. Street parking on both Friday night and on Saturdays is possible as well. Food: Eat at any one of a dozen restaurants within a block or two of the University or at one of the University’s five restaurants: Stella’s, Elements, Riddell Hall Cafeteria, Starbucks, etc. Proceedings: Selected, peer-reviewed papers will be published in the Journal of Mennonite Studies 2017. 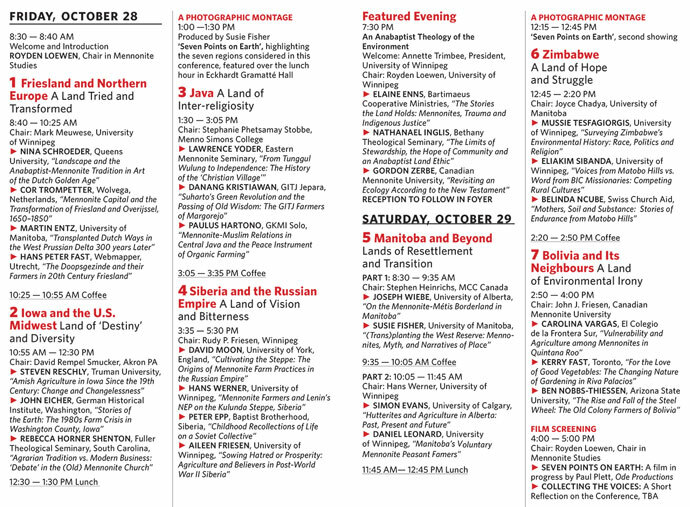 To subscribe, email r.loewen@uwinnipeg.ca. Current subscription cost $28/year.